According to the IUGS Subcommission on the Systematics of Metamorphic Rocks, Study Group for Impactites, a suevite or suevite breccia is a polymict impact breccia with clastic matrix and mineral clasts in various stages of shock metamorphism including cogenetic impact melt particles which are in a glassy or crystallized state. Suevite, Lake Mien (Sweden) impact structure. 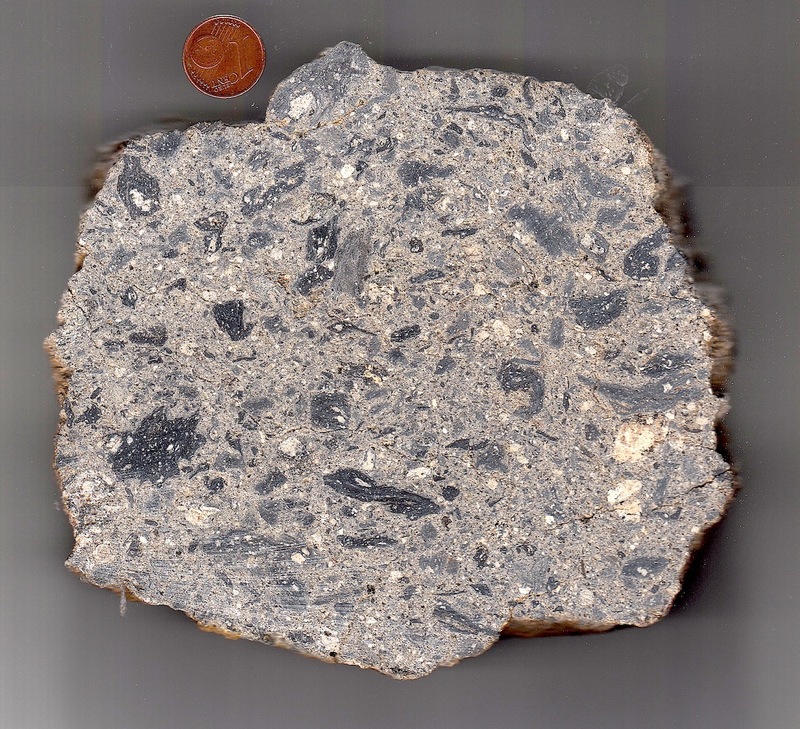 Originally, suevite was the name of a melt breccia in the Ries crater and derived from the province of Swabia in southern Germany, and such means “Swabian stone”. For decades, the Ries crater suevite was considered a peculiar volcanic breccia and unique in the world. Both the volcanic origin and the uniqueness had to be abandoned when the Ries suevite was shown to be a strongly shocked impactite and comparable rocks were found in many other impact structures worldwide. Only recently, within the frame of a new debate about the impactite nomenclature [see, e.g., http://www.lpi.usra.edu/meetings/lmi2008/pdf/3033.pdf , and HERE ], the Ries suevite and its classification have been revisited (Osinski,G.R., 2003, MAPS 38, 1641-1668; Osinski, G.R., 2004, EPSL 226, 529-543), and it is suggested the Ries suevite to be rather an impact melt rock (also see discussion on http://www.impact-structures.com/impact-rocks-impactites/impact-melt-page-impact-melt-rocks-impact-glasses-and-congeners/). Only recently, too, a suevite character has been attributed also to the polymictic breccia from the Steinheim basin impact crater in Germany supposed to be a companion impact of the Ries event (see Elmar Buchner and Martin Schmieder (2010) “Steinheim suevite – A first report of melt-bearing impactites from the Steinheim Basin (SW Germany)”. – Meteoritics & Planetary Science, 45, 1093-1107.) As we have shown HERE (No Steinheim basin suevite) and with regard to the suevite nomenclature this obviously is a misinterpretation by the authors. On this page, we show and describe suevites from different impact structures (Ries – according to the customary classification, Rochechouart, Dellen, Mien, Sääksjärvi, Lappajärvi, Siljan, Kara, Wanapitei) with special emphasis on the suevites from the Azuara and Rubielos de la Cérida impact structures (Spain).